[125 Pages Report] market size for imaging chemicals was USD 20.77 Billion in 2016, and is projected to reach USD 29.97 Billion by 2022, at a CAGR of 6.3% from 2017 to 2022. The base year that has been considered for this study on the imaging chemicals market is 2016, while the forecast period is between 2017 and 2022. 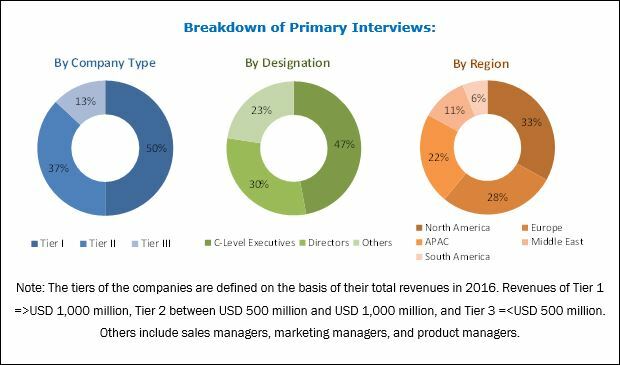 Both, the top-down and bottom-up approaches were used to estimate and validate the size of the imaging chemicals market, and to determine the sizes of various other dependent submarkets. The research study that was employed involved extensive use of secondary sources, directories, and databases, such as D&B Hoovers, Bloomberg, Chemical Weekly, Factiva, and other government and private websites to identify and collect information useful for the technical, market-oriented, and commercial study of the imaging chemicals market. Fujifilm (Japan), The Eastman Kodak Company (US), Vivimed Labs (India), DIC Corp. (Japan), Flint Group (Germany), Sakata Inx (Japan), Toyo Ink SC (Japan), Siegwerk Druckfarben (Germany), and T&K Toka (Japan) are key players operating in the imaging chemicals market. This research report categorizes the imaging chemicals market on the basis of product type, application, and region. The imaging chemicals market is estimated to grow from USD 22.08 Billion in 2017 to USD 29.97 Billion by 2022, at a CAGR of 6.3% from 2017 to 2022. Imaging chemicals are chemicals substances that used to produce or develop photographs. The imaging chemicals market is segmented by product type, application, and region. By product type, the printing inks segment is projected to lead the imaging chemicals market during the forecast period. The growth can be attributed to the growth of the printing & packaging and textile printing applications. The textile processing segment is projected to grow at the highest CAGR between 2017 and 2022. The growth can be attributed to the growing textile manufacturing industry. The imaging chemicals market in Asia Pacific is projected to grow at the highest CAGR between 2017 and 2022. China is the largest market for imaging chemicals in Asia Pacific. Increasing investments in the printing & packaging, textiles, and medical industries is expected to drive the market in this region. 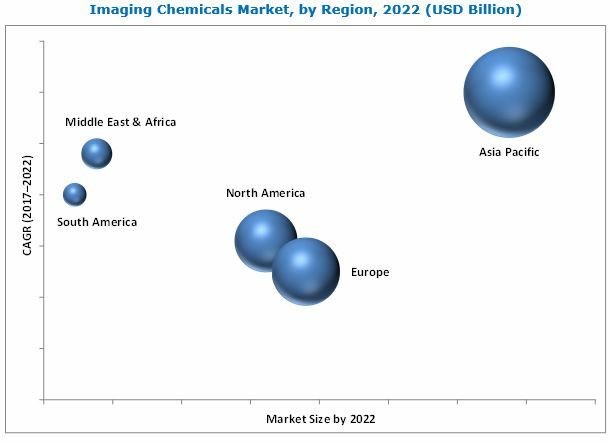 Key players operating in the imaging chemicals market include Fujifilm (Japan), The Eastman Kodak Company (US), Vivimed Labs (India), DIC Corp. (Japan), Flint Group (Germany), Sakata Inx (Japan), Toyo Ink SC (Japan), Siegwerk Druckfarben (Germany), and T&K Toka (Japan). These companies have adopted various strategies, such as new product launches, expansions, and mergers & acquisitions to enhance their market shares and expand their distribution networks across the globe. These companies engage in R&D activities to innovate and develop products that can open avenues for new applications. For instance, in November 2017, Flint Group opened a new facility in Turkey for its packaging division. The new facility is a 3,800 square meter manufacturing distribution facility. In April 2017, Sakata Inx introduced INXhrc inks at FTA InfoFlex. These are eco-friendly inks used for printing applications.